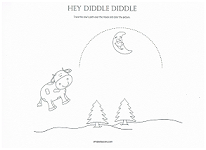 The Hey Diddle Diddle lyrics are considered a nonsense rhyme that may date back to the sixteenth century. Although nothing in this old-time rhyme could actually happen, it does spark a child's imagination in the same way that animated films do today. 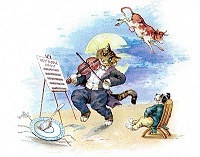 There are no lessons to be taught with this silly rhyme and perhaps that is part of why children enjoy it so much. 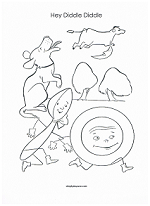 Each nonsensical line captures a child's interest and makes it very simple for them to learn. 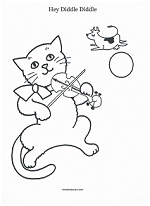 Add coloring or activity pages when you teach the rhyme for added fun. 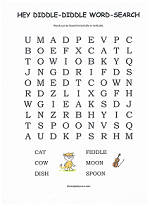 Try a Hey Diddle Diddle word-search. 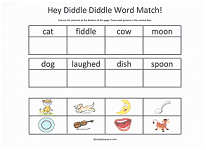 Have fun with a cut-and-paste word match for the rhyme or have the kids trace the cow's path over the moon and color the picture. 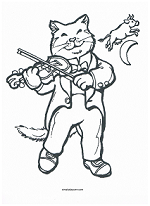 Go back to the Nursery Rhyme main page for more lyrics and activity pages.